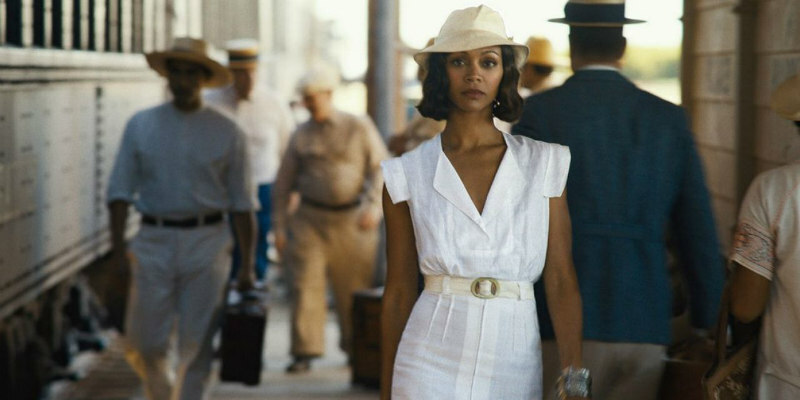 We look at Zoe Saldana's most memorable roles. Having starred in a wide range of both high-profile blockbusters and more character driven dramas, it’s safe to say that Zoe Saldana is one of the most sought after actresses working in the industry today. Last year saw her team with Oscar-winner Ben Affleck for Live By Night, an action packed crime thriller, set in the Roaring 20s amidst an underground network of gangster-run speakeasies. To mark the release of the film, out on Digital Download now and available on Blu-ray and DVD from Monday, we’ve rounded up her six most essential performances. Avatar is widely recognised as a visual extravaganza and a box office behemoth, having taken the spot of highest grossing film of all time from James Cameron’s previous film Titanic. However, its stunning effects and epic story would not have landed with audiences nearly as much without compelling performances at the centre, and this largely comes in the form of Saldana. She is utterly mesmerising as Neytiri and her love story with Sam Worthington’s Jake Sully is the beating heart of the movie. This drama, directed by Black Mass and Crazy Heart director Scott Cooper, centres on Russell Baze (Christian Bale), who takes justice into his own hands after his brother Rodney Baze Jr. (Casey Affleck) mysteriously disappears. The film is decidedly grittier fare than Saldana’s usual films and while it mainly centres itself around male characters utterly battered and beaten by life, Saldana provides a film that can be overbearingly depressing with nuance and heart. Infinitely Polar Bear follows a manic-depressive father (Mark Ruffalo) who tries to win back his wife by attempting to take full responsibility of their two young, spirited daughters. Maya Forbes creates a truly authentic story that treads a perfect balance between heartbreak and humour. It is also anchored by two achingly believable and compelling performances from Ruffalo and Saldana. Here’s hoping that Saldana continues to expand into more delicate and heartfelt pictures like this. The first reboot of the iconic Star Trek series came in the same year as Avatar, immediately solidifying Saldana as a welcome addition to any franchise, one of the most talented faces in sci-fi and someone capable of taking strong female characters and making them layered, believable and completely her own. As Lieutenant Uhura, Saldana gets some of the best moments and narrative arcs of the series; most prominently her captivatingly odd relationship with Commander Spock. Ben Affleck directs and stars in this action-packed crime thriller, set in the 1920s prohibition era, where rules are broken and secrets uncovered. Live By Night tells that while revenge may taste sweet, it can often come at a price. The film features an all-star cast including Affleck, Saldana, Elle Fanning, Brendan Gleeson, Chris Messina, Sienna Miller and Oscar winner Chris Cooper. Saldana is effortless in her role as Graciela Corrales and brings magnificent grace and gravitas to the part. Jumping straight back into the kind of sci-fi films that made her an internationally renowned star, Saldana shines in this story of a group of intergalactic criminals forced to work together. Considering that these are two of the best films in the Marvel universe and have an ensemble that features a multitude of brilliantly unique characters, from Dave Bautista’s hilarious Drax to Bradley Cooper’s racoon Rocket, anyone not bringing their A game would be eclipsed. In the hands of Saldana, Gamora is a commanding presence and certainly one of the consistent highlights of the series. Live By Night is out now on Digital Download and available on Blu-ray and DVD from May 22.